With all of the political and other news recently, this story got shuffled back in line, but that doesn’t make it any less important. 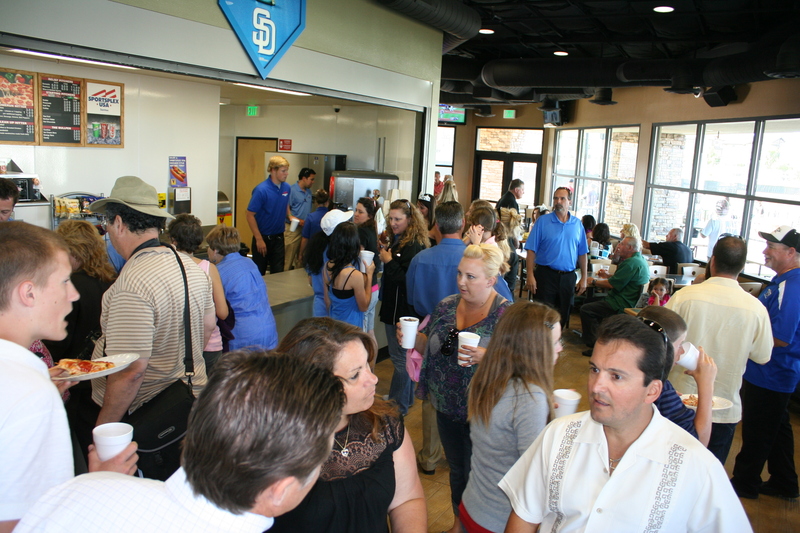 On Tuesday, June 1, a crowd gathered to celebrate the grand opening of the new Sportsplex USA facilities in the Town Center Community Park area between Rio Seco School and the Cameron Family YMCA. On hand for the ceremony were members of the Santee City Council, Santee Chamber of Commerce, and Santee Parks and Recreation Committee (SPARC). 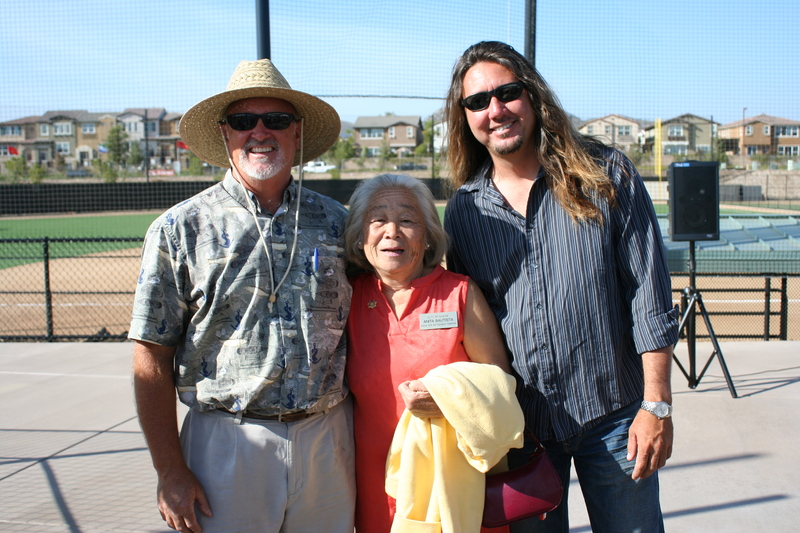 Other guests included developers, members of recreation teams, and several East County beauty queens. Councilman Jack Dale acted as Master of Ceremonies for the official opening. 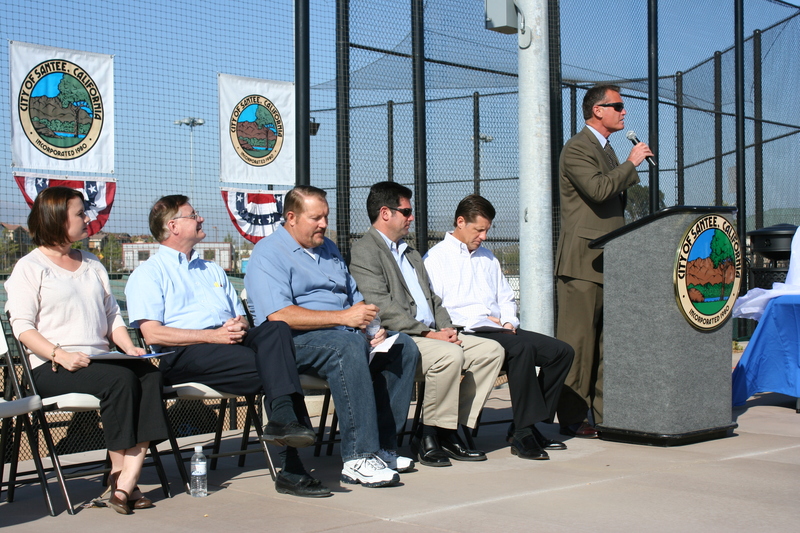 He was joined by fellow Councilmen Brian Jones and John Minto, Mayor Randy Voepel, City Manager Keith Till, Stacia de los Reyes from Assemblymember Joel Anderson’s office, and Bill Burghoff of Sportsplex USA. 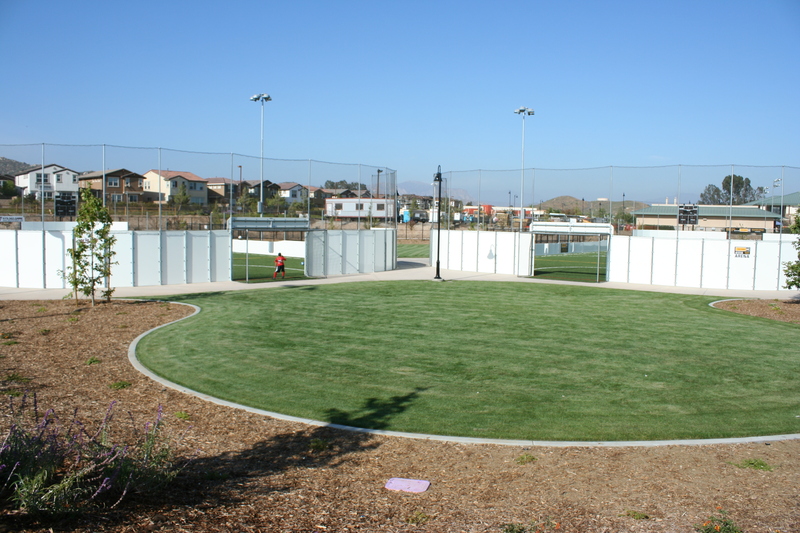 At 15 acres, Town Center Community Park is the largest community park in Santee, and there is still more to come. 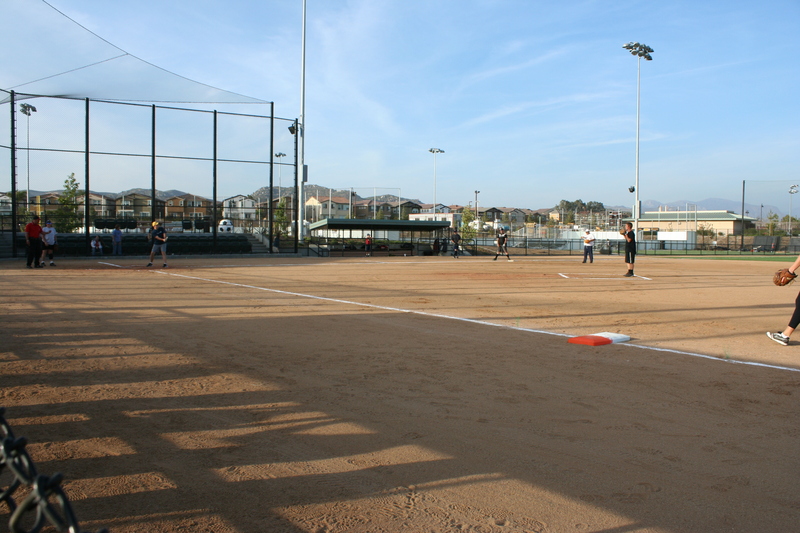 In addition to the softball and baseball fields there are enclosed soccer fields and a restaurant ready for use. The final phase will include more soccer/multipurpose fields, a stage, and picnic pavilions. During the opening ceremonies Councilmen Dale and Jones spoke about the importance of the facilities to the city, while Councilman Minto reminisced on his own days playing Little League baseball, telling the crowd, “One thing is true, we love our sports.” Speaking for Assemblymember Anderson, Ms. de los Reyes presented a State Assembly proclamation to the City of Santee and Sportsplex USA in honor of the opening. Sportsplex USA’s Burghoff spoke of the economic benefits of the facility, then with the help of facility Manager Eddie Vandiver, presented city officials with commemorative jerseys and softballs. 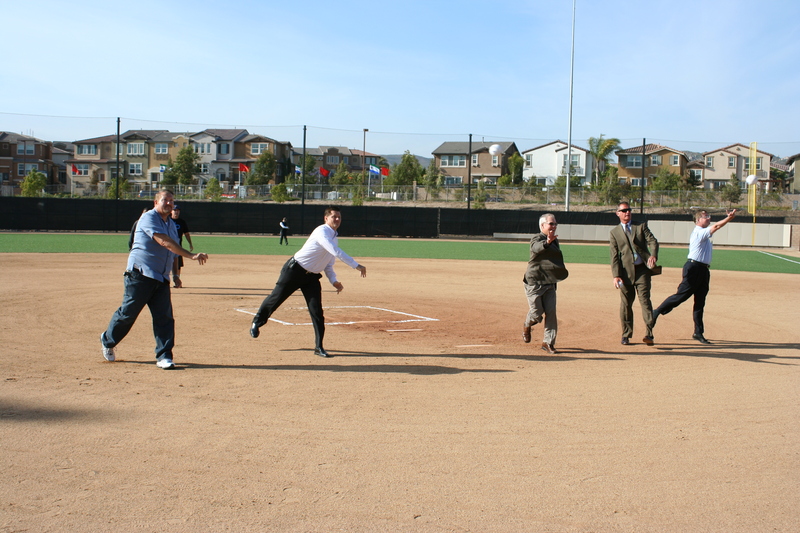 The ceremony concluded with the throwing out of the first pitch, or rather pitches, by the city leaders. To give an idea of how popular the facility already is, there were 140 softball teams and 40 soccer teams signed up before the Grand Opening. In addition every weekend is booked with games and tournaments through December. There is a fee for the use of the facility, but this fee will allow Sportsplex USA to maintain the fields and other features without using city funds. Additionally, sponsorship by several local businesses helped to cover costs of construction, saving more and allowing more to be done. A big “Thank You” to Al’s Sports Shop, Hawthorn Machinery, L&L Hawaiian Barbecue, Pure Flo, and Sports Clips for stepping up to help make this all possible.